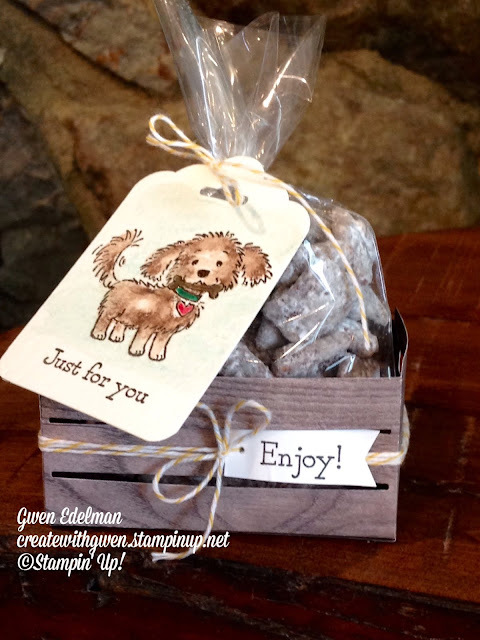 Create with Gwen: "Puppy Chow" Treat Crate! So stinkin cute! The Bella and Friends Stamp Set is adorable! Couldn't resist teaming it up with the Wood Crate Framelits! Easy peasy. Die cut the wood crate, assemble, add some coloring with Watercolor Pencils, punch out tag and attached with Baker's Twine. My wonderful friend, Lea, made the "Puppy Chow". Great little treat of humans! So good and perfect for these wood crates! Here's the recipe. Chow down; it's doggone good! Just make sure you save some for the crates! Tip: If you must be gluten free, always read labels to make sure each recipe ingredient is gluten free. Products and ingredient sources can change.